OrderReplicator listens to orders created on a Trader Workstation/IB Gateway instance and automatically replicates these orders on another TWS/IB Gateway instance. Replicated order sizes can be automatically scaled with a multiplier or divisor. All configuration settings (connection and order size scaling) are specified on plain text files. 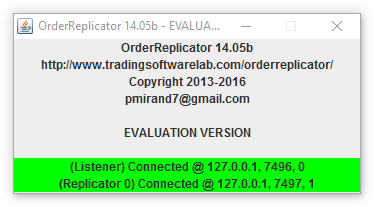 OrderReplicator works on Windows, Mac and Linux. The screenshot shows the listener and replicator functionalities connected to two different TWS instances running on the same computer. By purchasing the software you agree to use it for personal purposes only (to negotiate a different license contact me). You cannot transfer, rent, lease, lend, copy, share the software and/or documentation. You cannot adapt nor change the software and you cannot re-sell the software. You may not reproduce or distribute any documentation without my permission. You may install a copy of the software on a computer and freely move the software from one computer to another, provided that you are the only individual using the software. In no event shall I be liable for any special, incidental, indirect, or consequential damages whatsoever (including, without limitation, damages for loss of business profits, business interruption, loss of business information, or any other pecuniary loss) arising out of the use of or inability to use the software product or the provision of or failure to provide support services. Questions ? Use the Contact form. Member NYSE, FINRA, SIPC. Visit www.interactivebrokers.com for more information. Copyright © 2013-2019 Trading Software Lab. All rights reserved.